Code Softwares Solutions PramukhIME : An Input Method Editor based on "The way you speak, The way you type. 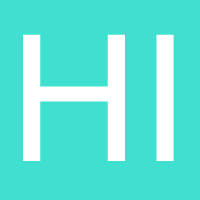 PramukhIME : An Input Method Editor based on "The way you speak, The way you type. 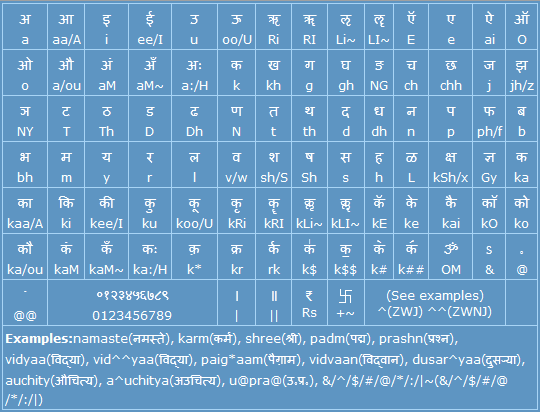 PramukhIME is an Input Method Editor(IME) program for Indian Languages. You can easily type in 20 Indian languages into MS Office (Word, Excel, PowerPoint), Internet Explorer, Firefox, Opera mini, Safari, Notepad, Facebook, Google+, Twitter, Yahoo Messenger, Google Talk or any other Unicode aware applications. Open the extracted PramukhIME folder and double click on the PramukhIME.exe, it will show an icon in the system tray at the bottom-right corner of your computer screen as shown below. Click on the icon to explore all options. When you click on the PramukhIME icon, you will see the following menu. Indian Languages: Using PramukhIME, you will be able to type into 20 Indian languages - Assamese, Bengali, Bodo, Dogri, Gujarati, Hindi, Kannada, Konkani, Maithili, Malayalam, Manipuri, Marathi, Nepali, Oriya, Punjabi, Sanskrit, Santali, Sindhi, Tamil and Telugu. When you start PramukhIME for the first time, English will be your chosen language. Whatever you type will be in English. Choose the Indian language and now you will be able to type into that language in any application including but not limited to MS Office, Internet Explorer or Notepad. Use F9 (your preferred Shortcut Key) to toggle between English and your preferred Indian language. Show Keyboard: It will show keyboard for your selected Indian language. If you have selected English, it will show general instructions. This keyboard will always be on the top of all open applications for your quick reference. To show keyboard, you may either click on the "Show Keyboard " option or your use Ctrl + F9 (or your preferred shortcut key) to quickly open help file. Help: When you click on this option, it will open up help file that comes with this application. If you have selected any Indian language, for your convinience you will be directed to help page for that language automatically. Otherwise, it will open up the first page. This help file contains detailed instructions about typing in your language along with examples. It also contains solutions for common problems and helpful tips for avid users. Settings: It will open a PramukhIME Settings dialog. You will be able to set your own shortcut keys for various tasks and some advanced options. For details, please visit PramukhIME Settings page. Show Menu: This option is always disabled. This options is here to remind the user that s/he can open the menu using a shortcut key. 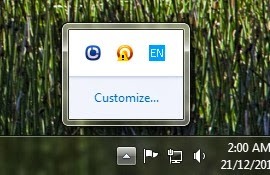 About: This option will open up About window. Exit: This option will exit the application. Upon exiting the application, your settings will be saved so next time when you open the application, all settings will be exactly as when you had it open. 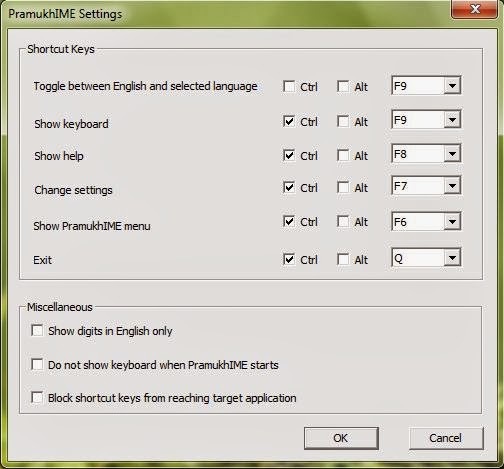 You may open PramukhIME Settings by clicking on PramukhIME system tray icon and selecting "Settings" from the menu or pressing Ctrl+F7 (or your preferred Shortcut Key for Settings). Shortcut Keys: In this section, you will assign shortcut keys for PramukhIME. You may press these key combinations regardless of the application in which you are currently typing and appropriate PramukhIME tasks will be performed. If the key combination is a valid shortcut for the application you are currently typing in, it will also process this shortcut key along with PramukhIME. This behaviour can be changed in Miscellaneous settings. Toggle between English and selected language: Using this shortcut key, you will be able to switch between English and your selected language without using mouse. Show keyboard: This shortcut key shows the keyboard for selected language. Exit: You can close the PramukhIME using this shortcut key. Do not show keyboard when PramukhIME starts: When PramukhIME starts, it always shows the keyboard. You will need to close it if you don't want to see it. Using this option, keyboard will not be shown when PramukhIME starts. You may open the keyboard later. Block shortcut keys from reaching target application: When you select this, the shortcut keys for PramukhIME will not reach to the target application. For example, pressing F10 in Microsoft Word opens a "Save As..." dialog box. If you want to assign F10 as a shortcut key for switching between English and your selected language, it will open up "Save As...". If you select this option and then press F10 key for switching the language, this shortcut key will not reach to Microsoft Word and hence it will not open up "Save As..." dialog box. Writing Hindi words using PramukhIME is as easy as writing our names in English. For quick help, checkout the following image. This image shows which letter(s) will be printed when you press a particular key (combination). Press F9 (or your preferred Shortcut Key) to switch between English and Hindi. How do I start PramukhIME automatically when I login to computer? How can I type digits in English but rest of the text into selected language? How can I block PramukhIME shortcut key from reaching to the target application? How can I run two instances of PramukhIME with different keyboard layout? How do I start PramukhIME automatically when I login to computer? : If you are an avid user of PramukhIME and want to start PramukhIME as soon as your computer starts, you can automate this process so you don't have to navigate to file and click on it to run. Right click on PramukhIME.exe file and click on "Copy". Now navigate to the folder C:\Documents and Settings\USERNAME\Start Menu\Programs\Start (For Windows Vista/Windows 7 user, navigate to C:\Users\USERNAME\AppData\Roaming\Microsoft\Windows\Start Menu\Programs\Startup). USERNAME is your login id. Now right click on empty area click on option "Paste Shortcut". This path contains hidden folder. If you don't see the folder, go to Windows Explorer > Tools menu > Folder Options... > View tab > select "Show hidden files, folders and drives". Now next time when you login, PramukhIME will automatically start. How can I run two instance of PramukhIME with different keyboard layout? Note: On logon screen PramukhIME will not type in the selected language. How can I block PramukhIME shortcut keys from reaching to the target application? : Open PramukhIME Settings window and select "Block Shortcut Keys from reaching target application" and PramukhIME will block the shortcut keys after processing it. How can I run two instances of PramukhIME with different keyboard layout? : If you want to run PramukhIME with multiple keyboard layout, merge both PramukhIME folders into one. It will overwrite all common files and put all necessary files at appropriate location. Now when you open PramukhIME, it will show multiple keyboard layouts.